Attracted by the history of the restaurant, The Dragon Phoenix (龙凤厅) at the Fairmont Peace Hotel (和平饭店) was a must try for me on our visit to Shanghai. 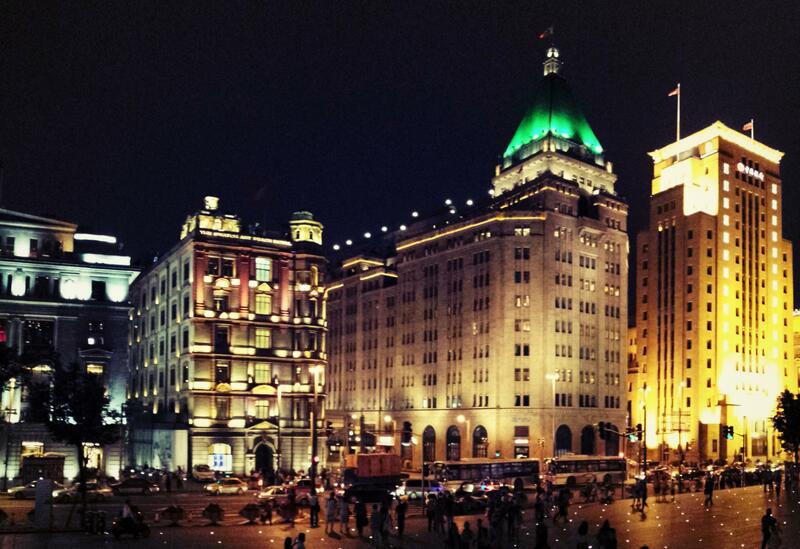 The Fairmont Peace hotel has long been a landmark on The Bund of Shanghai, divided into the South and North building, it dates back to more than a century ago. The South building dates back to the 1850’s and was restructured and renamed from Central to Palace Hotel in 1903. The structure that still stands today was once the tallest building on Nanjing Road, standing at six stories, and was the first in Shanghai to offer two elevators. Named after prominent British businessman Sir Victor Sassoon, the 10 storey North building was completed in 1929, housing the luxurious Cathay Hotel which was known as “the number one mansion in the Far East”, welcoming distinguished guests from all over the world. 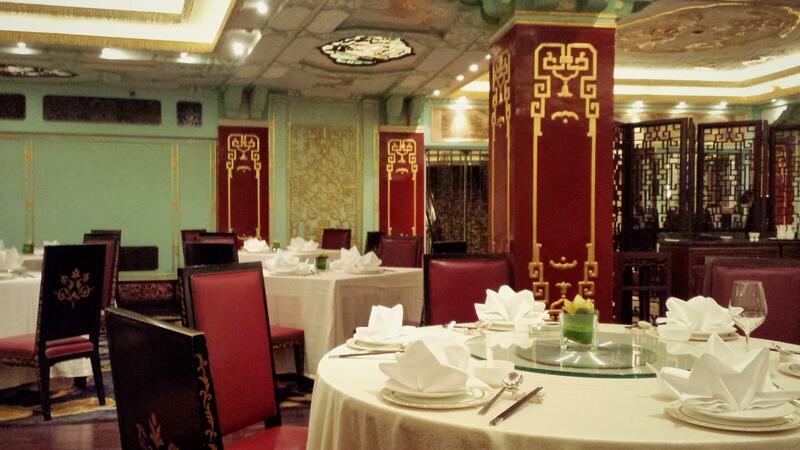 Located on the eighth floor, Dragon Phoenix was the original Chinese restaurant in the Cathay Hotel. Seats at the Emperor Table, where reservations were made a year in advance, was said to have served more celebrities than any other seats and any other restaurants in the world. The hotel was renamed Peace Hotel after the war and in 2007 underwent an extensive external and internal refurbishment/restoration program revitalising this historic building back to its original glamour. Today this classical luxury restaurant remains a premier dining place offering quintessential Shanghainese and Cantonese cuisine. Stepping into the hotel/restaurant, you’re instantly transported back to the opulence of old Shanghai. Whilst we’d booked well in advance, I wasn’t aware that some of their signature dishes also had to be pre-ordered so unfortunately we didn’t get to try some of Chef Xu’s specialty. Though we did try a number of their Shanghai Signature Appetizers including stewed bran dough with peanuts, mushrooms (四喜烧烤麸), poached sliced pork belly with ginger and garlic sauce (蒜泥白切肉), marinated jellyfish with black vinegar (上海特色海蜇头), and tender chicken preserved in rich rice wine (和平香糟鸡). We tried a number of mains but I’d say their double boiled pork meatball with mushrooms (石耳狮子头) was the best. Overall, was it the best food I’d ever tasted? Probably not. But the personalised service, amazing views of Huang Pu River and Pudong and the chance to visit this brilliant building of significant historic importance made it all worthwhile. On the same floor as the Dragon Phoenix is one of Shanghai’s most famous ballrooms – Peace Hall. High ceiling, crystal chandeliers, art deco detailing, white maple dance floor, Peace hall comfortably fits 300 people banquet style. Another unmissable place of interest at the Peace Hotel is The Jazz Bar, a favourite for the city’s expatriate community since the 1930s. If you haven’t yet been transported back to the 1920s and 30s, a visit to the Jazz Bar will surely do the trick. Authentic decor, impressive wine and cocktail list and the six veteran musician, averaging 80 years old, making up the Old Jazz Band accompanied by a female vocalist showcasing a repertoire of famous Shanghai tunes.